In hands-on testing, PT found that completing several management tasks on a Dell EMC PowerEdge FX2 private cloud solution required similar time but an average of 34 percent fewer steps compared to an AWS public cloud. Staying on-premises with a Dell EMC private cloud also allows datacenter administrators to use familiar VMware software and retain control of security implementation. Durham, NC, February 06, 2018 --(PR.com)-- In today’s competitive market, the type of cloud a business chooses will affect their datacenter administration for years to come. 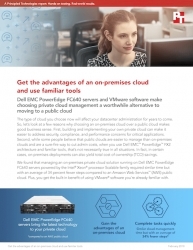 Principled Technologies (PT) tested eight common cloud management tasks on both a Dell EMC PowerEdge FX2 private cloud solution - running on Intel processor-powered Dell EMC PowerEdge FC640 servers and VMware vSphere and vRealize Suite cloud management platforms - and a public AWS solution. Their testing found that choosing a public cloud isn’t a surefire way to cut admin costs. The time involved in managing both solutions was similar, while the Dell EMC private cloud required an average of 34 percent fewer steps across the eight management tasks they tested. Moreover, the on-premises Dell EMC PowerEdge FX2 solution could allow datacenter administrators to retain precise control over how they implement their security strategies. To learn more about how the Intel processor-powered Dell EMC PowerEdge FX2 architecture and FC640 servers can help datacenters adapt to ever-changing business needs, read the full report at http://facts.pt/UpcZP4, check out the infographic at http://facts.pt/kad4sh, and view the video at http://facts.pt/GMsReG.